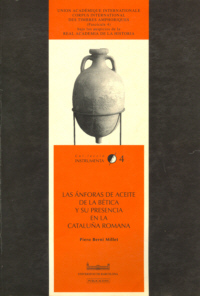 As the title shows, P. Berni's book deals with two main subjects: Roman Baetican olive-oil amphorae and its distribution in Catalonia's region, one coastal area of the former Roman province of Tarraconensis. Actually, the book also presents a discussion on the context of the Baetican's olive-oil distribution and a critic catalogue of the amphorae epigraphic evidence in Catalonia's area, chiefly the stamps as the number of tituli and graffiti of the corpus is very scarce. A complete list of drawings in 44 figures, 4 photographic plates and a 1:1 drawing of all the epigraphic evidence provided an indispensable and rich complement for both the discussion on typological and chronological issues and also for a better understanding of the new data published. Many different indexes (alphabetic for all the stamps, both from the first and the last letter, list of stamps clustered by provenance, corpus number, production centre and date, literary, juridical and epigraphic sources, personal names, topographical and analytical) allow the reader an easy found of any reference and makes this book a very friendly working tool. It is also quite remarkable the way P. Berni's use such different sources, revealing a solid technical and cultural background that allows unusual proficiency with different domains such as archaeology, ceramic studies, epigraphy and Ancient History. Despite being a monographic study on one region, this work is one piece of more ambitious projects, the International Corpus of Roman Amphorae Stamps, held by the Union Académique Internationale, and the general on-line database on Amphorae epigraphy, held by CEIPAC (Barcelona), both directed by J. Remesal Rodríguez. In the first chapter - The Baetican olive oil amphorae - P. Berni presents a brief account on the basis of the research, from the Monte Testaccio, as the major consumption deposit of those amphorae, to the Guadalquivir and Genil riverbanks, where the production centres are located. After this brief introduction to the subject, P. Berni presents an extensive discussion on the origins of this peculiar Iberian Roman amphora, inspired in late Republican south Italic models (23-33), gathering all the known evidence, from the Augustan military camps in the Germanic limes area to the Mediterranean shipwrecks, passing through other examples from different archaeological sites (Fig. 3-6). He was able to define an early Augustan type - also known as Oberaden 83, Haltern 71 or "archaic" Dressel 20 - from another one, with different chronology, the so-called Augustan / Tiberius type, both seen as the prototypes of the "classic" well-known Dressel 20 amphora type. Following the concern with these amphorae epigraphic evidence, the author identifies three examples of tituli picti from the fossa aggeris in Rome, already published by H. Dressel, presumable dating from this early phase of the production (31-3 and Fig. 6c). These epigraphs can be seen as the earlier form of what became the "canon" of the typical Dressel 20 tituli picti system. The analysis of those most ancient ovoid amphora types is one of the more innovative proposals of the work, as the evidence is scarce and there is no tradition on considering these less-known early forms. P. Berni's morphological analysis, remarkable depicted in the Fig.3 scheme (24), is a consistent hypothesis that should be confirmed by more research in the production area of Guadalquivir and Genil riverbanks, as it is possible to admit a more ancient moment for the creation of the peculiar ovoid morphology of the Baetican olive-oil amphora. One should stress that all P. Berni's analysis is based upon examples collected outside the production area and so belonging to one moment when those amphorae have already a volume of production that justifies its large exportation. In the subsequent pages (33-62) the author present a general overview on the evolution and transformation of the Baetican olive-oil amphorae, from the Julius-Claudian type until the Tejarillo 1, Dressel 23 and other late amphora types. The main typological phases included the Julius-Claudian, Flavian-Traianus, Antonine, Severian and post-Severian, besides the late period, with a considerable variety of forms. For all of those periods, P. Berni identifies small variants (parvae) that were produced with the canonical amphorae forms. Based both in internal data and amphorae typology, the author sketches the main tendencies on their typical epigraphic habits, one of the most relevant issues on Baetican olive-oil amphorae studies. Those pages clearly shown all the amount of evidence gathered by P. Berni, from the Rome finds analysed by E. Rodríguez Almeida to the Augst and Kaiseraugst stratigraphic evidence presented by S. Martin-Kilcher. Gathering all the evidence in a critical approach, the author gives the empirical support for the evolutionary formal scheme presented in Fig.3. One may say after all these years that P. Berni's typological / chronological sketch proved to be the more coherent and reliable on the formal study of the Baetican olive-oil amphorae evolution, chiefly because it join the well-known evidence from the Testaccio with the other from two different periods, the earlier and the latter, both absent, as far as we know, from that remarkable Roman pot-sherd archive. The second chapter (63-98) deals with the spread of Baetican olive-oil amphorae in Catalonia and may be considered the other core chapter of the book. Besides the discussion on relevant issues, such as the circuits of distribution, the commercial networks and the way as the arriving and distribution of the Baetican olive-oil amphorae may have interact with the local olive oil production, the author provides an ample analysis of the Catalonian evidence, considered in its chronological framework and in its distribution pattern. The general pattern suggests an ancient and consistent import of Baetican olive-oil amphorae in the region, with a "crisis" related to the Severian period. This "crisis" was not so different from those recorded in the Narbonne or even in Rome, according to the Testaccio's evidence. On what concerns to Catalonia, this evidence seems to confirm the model proposed by S. Keay for the economy of the Conventus Tarraconensis in the third century. In that period the imports from Africa, the homeland of the new emperor Septimius Severus overlaps those from other origins. But this does not mean the end of Catalonia's import of Baetican olive-oil, as in towns such as Tarragona, Barcelona, Badalona or Mataró one can observe a significant presence of Baetican olive-oil amphorae in later periods, mainly in the fifth century. A new decline period may occur in the VI century, when the African imports acquire, once again, a major expression. The main conclusions should be crossed with the detailed catalogue of archaeological sites' evidence presented in chapter 3. The catalogue (chapter 3, 99-169) presents the evidence by site placed in a regional context. In these two chapters, P. Berni presents both the general discussion of the presence of the Baetican olive oil in Catalonia and the sources he used to support the conclusions. It's not just the analysis of the information gathered from the different sites, but also its contextual presentation. All the amphorae sherds are presented by drawings (Figs. 19-44) and one may discuss the classification of few of them, chiefly those more problematic, belonging to the latter period, such as some of the Fig. 41 and Fig. 42 (192-193). Nevertheless, those problematic fragments do not affect the general picture depicted by the author because such few cases are insignificant. The fourth and last chapter is the amphorae epigraphic corpus from Catalonia, most of all stamps. As a final remark, one may say that P. Berni's book is a remarkable contribution for the study of the ancient commerce on Catalonia's area. But it is also more than that as the analysis of the evolution of both Baetican olive-oil amphorae and the epigraphic habits related to its diffusion area actually issues of universal use and utility. Actually it's easy to review a book eight years after its publication, as one can notice its fortune among students and scholars. So one can say that all that Piero Berni's book deserves all that fortune as it is a good example on how to write history from archaeological sites, epigraphic evidence and pot-sherds, building a solid, critic and pertinent enquire to all those sources.